Rahul's second Twitter account has started to gain immense popularity, and each tweet has been getting more than 200 likes. The account now has four tweets in Malayalam and a tweet wishing the people of Kerala a happy Vishu. Wayanad: Congress president Rahul Gandhi now has a new verified Twitter handle named 'Rahul Gandhi-Wayanad'. Rahul already has more than 9.2 million followers on his own Twitter handle and has gained 1,200 followers on his second account. The account now has four tweets in Malayalam and a tweet wishing the people of Kerala a happy Vishu. The first tweet, published on April 10, was after the death of India's longest serving politician KM Mani, and the second tweet gave out details of Rahul's campaign in Kerala. Rahul's second Twitter account has started to gain immense popularity, and each tweet has been getting more than 200 likes. 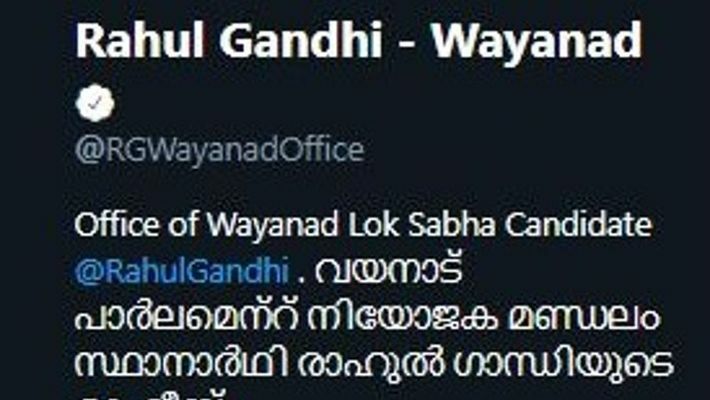 Another Twitter handle which has been named, 'Office of Wayanad Lok Sabha Candidate Rahul Gandhi', follows 25 accounts including those of former Union minister Shashi Tharoor, former Kerala chief minister Oommen Chandy and Kerala leader of opposition Ramesh Chennithala. There are more than 4,000 tweets on Rahul's primary account which he has often used to speak about the policies of the Congress, criticise the Narendra Modi government and wish people across the world. Rahul filed his nomination for the Wayanad Lok Sabha seat amid speculation that he may choose to contest from a 'safe' second constituency apart from his primary seat of Amethi, where BJP's Smriti Irani is neck and neck in terms of popularity. Rahul's sister and the Congress's general secretary for eastern Uttar Pradesh, Priyanka Gandhi Vadra, tweeted shortly after Rahul filed his nomination from Wayanad and told the people of Wayanad that he would not let them down. Rahul has been mocked by the BJP for opting to contest from both seats. Irani, who will be contesting from Amethi, said that the Congress considers Wayanad a 'safe seat' as it has a large minority population. Congress president Rahul Gandhi likely to use Wayanad as plan B?